Situated in the Raigad district of Maharashtra, this beautiful hill station, Matheran, remains untouched by the hustle and bustle of the city which surrounds it. The place experiences pleasant weather throughout the year; the place is exceptionally beautiful during the monsoon season. Matheran is considered as Asia's tiniest hill station and remains pollution free as no motor vehicles are allowed on its tiny roads or on the pathways which lead into the deep woods. The place has a lot to offer from scenic view points and long treks through the forested areas and picturesque beauty. By Air: The nearest airport is the Chatrapathi Shivaji International Airport, which is located at a distance of 44 km from here. The airport is well connected to all the major cities across the country such as Delhi, Chennai, Bengaluru, etc. By Train: The major railway station is the Karjat Station which is well connected to all the major towns and cities across the country. One can alight at this station and hire a taxi to reach the place which is approximately 19 km away. By Road: One of the best ways to reach Matheran is by road. The town is well connected by roads and there are regular buses which operate from major cities to Matheran. 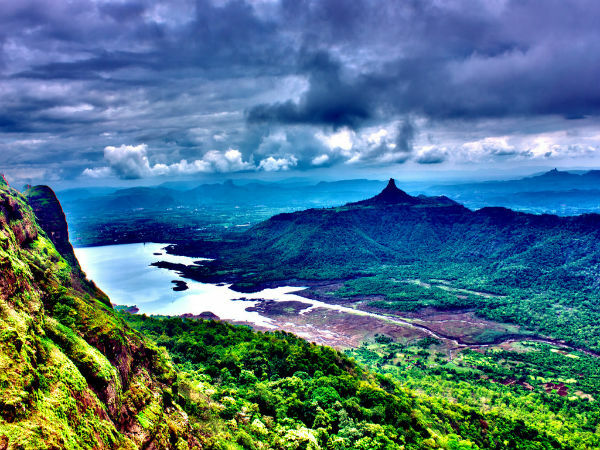 Best Time To Visit Matheran: Matheran is a year round destination. Those who want to opt for Route 1, it would take you approximately around 2 h to reach Matheran, via Mumbai-Pune Highway. The route takes you through the well-known towns of Navi Mumbai, Karjat, etc. The roads are well-maintained, which helps one to cover the distance at a good pace and the distance is about 80.3 km through this route. If you opt for Route 2, it would take you approximately 2.5 h to cover a total distance of 79.8 km from Mumbai to Matheran, via Badlapur-Katai Road. On Route 3, it would take you around 3 h to cover the distance of 85.2 km, via Mumbai-Agra Highway to reach Matheran. Navi Mumbai can be an ideal stopover for some delicious breakfast; after a filling breakfast, one can go around the place. Navi Mumbai is a planned township of Mumbai city which is divided into two parts, the North Navi Mumbai and the South Navi Mumbai. A major attraction here is the Wonders Park, which hosts the replicas of the seven wonders of the world. The park also has numerous rides, both land and water which visitors can enjoy at a very nominal amount. The Parsik Hill is another attraction here; the hill has an area of approximately 15 sq km of reserve forests. The highest peak in the hill measures about 235 ft, which also has Navi Mumbai's mayor's residence. Unlike other hill stations, there are not many sights to be seen here except for a few of them; one such place is the Alexander Point which opens up to provide you with beautiful views of the surroundings and the downhill village of Borgaon. The muddy roads which are bordered by dense tall trees and thick short bushes is a respite for trekkers who come here to explore the hidden trekking trials of Matheran. The next attraction here is the Prabal Fort which was captured by Chathrapathi Shivaji from the Mughal rulers. The fort is now in ruins and is located on the flat top of a hill named Prabal. Sharlott Lake also known as Charlotte Lake due to the local pronunciation, is one of the most beautiful spots in the area. On the right of the lake is an ancient Pisarnath Temple, and on the left are two well known picnic spots namely Louisa Point and Echo Point.